I have to say that if there was an Ogbono soup joint in Nigeria I would be their first guest. I am crazy about ogbono. My mother makes the best kind with Ugu (pumpkin) as the vegetable. For this recipe I decided to add Okra to the mix and boy did we lick our fingers. Not only is this soup a great kid pleaser, it is a adult satisfier. I don’t think I have ever enjoyed any other Ogbono soup apart from my mom’s and mine. I miss my mommy and her cooking and I know she would give me a thumbs up for this one. Wash and place meats in a cooking pot. Season with the ata-rodo(blend first), salt, 4 tbsps. of the crayfish, bouillon and salt. Let the meat cook in it's own juices first. Once, it is a little dry, add about 3 cups of water and check for seasonings. Cover and cook the meats until it is tender. This entry was posted in main dishes, main meals, Nigerian Casseroles, Nigerian sauces, Nigerian soups, Nigerian Stew, Sauces, Soups, Stews, Swallow and tagged Apon soup recipe, Nigerian food blog, Nigerian soup recipe, Nigerian soups, Nigerisn soup recipes, Ogbono and Okra soup recipe, Okra soup recipe. 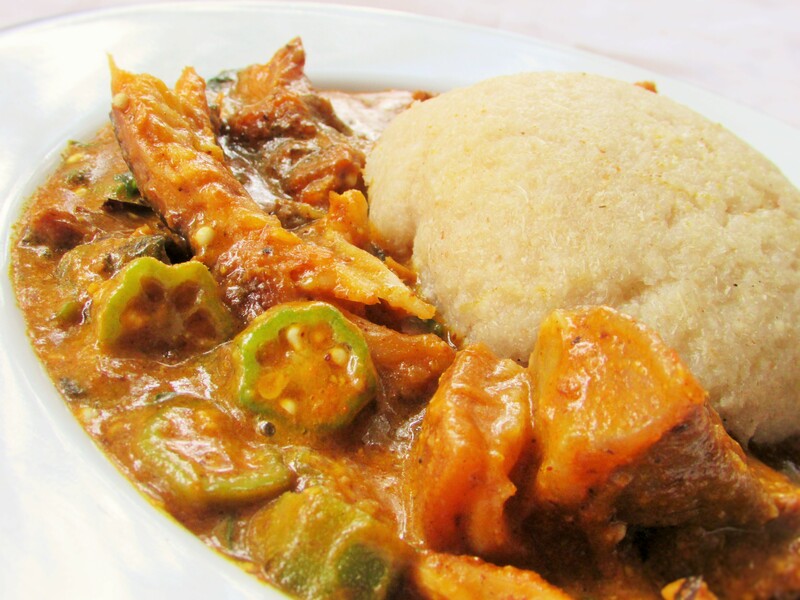 Nice…Ogbonon and okro one of my best soup..